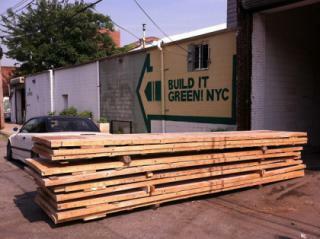 “Build it Green NYC” is a non-profit retail outlet for salvaged and surplus building materials. Its reuse centers in Queens and Brooklyn have everything from panel doors to high end refrigerators, window shutters to reclaimed lumber. BIG!NYC’s aim is to reduce impacts by keeping these materials out of the landfill, while offering deep discounts on their resale. All proceeds help support BIG!NYC and CEC's environmental initiatives around the city, including BIG!Compost, BIG!Blooms, materials for raised garden beds at community gardens, and is is a rich source for green jobs and training, offering internships for students, volunteers and continuing education classes.